I recently presented EWB’s work on agricultural extension services in Ghana at the Global Forum for Rural Advisory Services (GFRAS) annual meeting in the Philippines. I introduced our approach to bringing practical entrepreneurship training to Ghana’s agricultural colleges and innovations to the extension services sector. This forum is important at the international level, influencing and advocating for policy development and research on extension. Participants were very interested in EWB’s work and the changes that we are driving towards. They like our systemic approach and respect our field level knowledge. Watch out for flying golf balls. 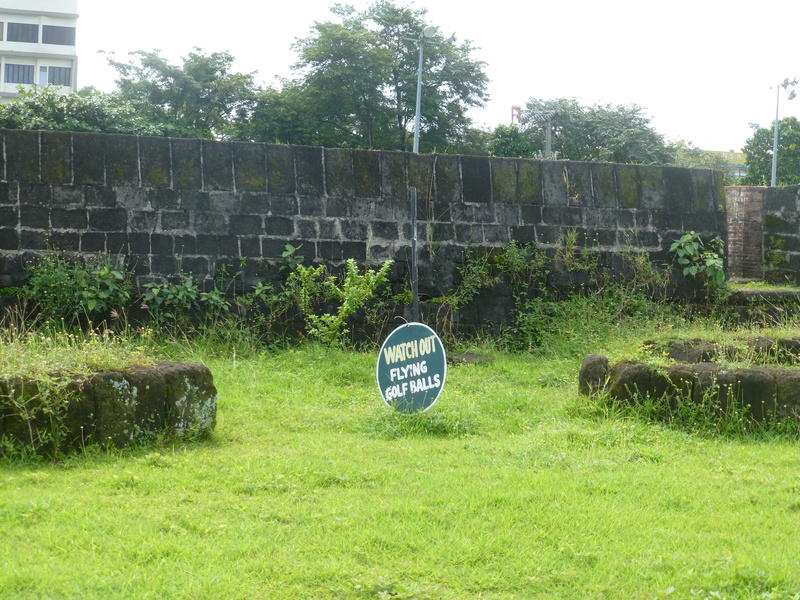 The irony of having a golf course at a historical site in Manila. In participating in global fora, it is crucial to watch out for the ironic flying golf balls of lots of great discussions but lack of application and operationalization and sometimes the unheard voices of local field realities. What is EWB’s role, as a Canadian NGO operating on the ground in Africa, in a global forum like the GFRAS? I think that there is something to be gained from sharing our work, networking and building relationships with new partners. We can leverage this opportunity to influence other actors in the sector and global priorities. EWB also has a lot to learn from the diversity of experiences, innovations, perspectives and research shared at forums like GFRAS. For example, I learned about the successes and challenges of other African countries in establishing GFRAS country fora. These lessons learned have informed EWB’s work in Ghana in helping to establish a Ghanaian Country Forum on Agricultural Advisory Services. But I think there is another niche that EWB, among others, can create at the global level, which is asking the tough question: so what? What is the impact and the change that the discussions, research, policies and advocacy efforts globally are driving locally? This question recognizes the importance of high level discussions, policy analysis and global networking, but it pushes the participants one step further, towards questions of application and implementation. Ensuring that work at the global level is relevant to those working in the field. Ensuring that it has impact on those that we are all working for and with: farmers. This is not to say that this question was not asked at the GFRAS annual meeting. In fact, I was impressed that half of the time that we had to discuss extension policy development was spent sharing experiences and stories on extension policy implementation. My argument is that those working at the field level have a role and even a responsibility to be bringing their own experiences to these discussions in order to drive engagement on how we can be implementing global priorities locally. Those embedded in field level realities, such as practitioners, extension service providers, farmers and EWBers, have a unique perspective on the extension sector. Their experiences are grounded in local contexts and realities, and sharing these perspectives can help to bring the ‘so what’ question to the global table. They can engage others in the realities of the constraints and opportunities of implementing global policies, research and priorities in their own extension or agricultural work. It is important that these actors bring these perspectives to the global arena to help ensure that discussions are relevant and create real impact on the ground. A core EWB value is to ask tough questions, and I think tough questions about realities, relevance and application are necessary to building effective forums with impact. One of EWB’s core values is to Ask Tough Questions, pushing analytical and critical thinking.